Use of an UV Excimer lamp. This lamp has a higher efficiency than any traditional UV lamp. 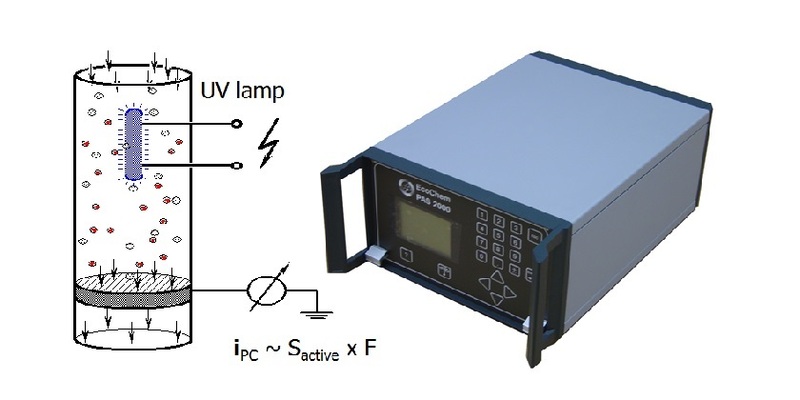 The Excimer lamp can be rapidly switched on and off without a time delay. The offset produced by pre-charged particles can be eliminated by operating the lamp in a chopped mode. Software: User-friendly PC-compatible graphical software collects data from PAS 2000. The software displays real-time strip charts and calculates averages. Data is stored in a variety or formats. Flat ASCII file output can also be generated for further analysis in standard spreadsheet programs (e.g. Microsoft Excel). Data Acquisition Software: User-friendly PC-Compatible graphical software collects data from PAS 2000. The software displays real-time strip charts and calculates averages. Data is stored in a variety of formats. Flat ASCII file output can also be generated for further analysis in standard spreadsheet programs (e.g. Microsoft Excel).